I don’t think I can tell you how much time I’ve spent trying to get my Pride and Prejudice loving friends to watch Bride and Prejudice. I know this film might be considered Bollywood by some, but I don’t really consider it part of that genre. The film is in English, where as some Bollywood I’ve seen have subtitles. Also, I think a lot of people who love Pride and Prejudice are Anglophiles, so this film is probably intended primarily for American and British audiences. This film is peppered by musical numbers filled with bright colors, dancing and singing. While this film is fun to watch and has me singing and dancing around my house, it never quite satisfies my need for Darcy. Set in modern India, Bride and Prejudice is the story of the Bakshi family, who is trying to marry off their four daughters, Lalita (Elizabeth), Jaya (Jane), Maya (Mary) and Lakhi (Lydia). However, Mrs. Bakshi isn’t just interested in courting Indian men. Balraj is an Indian man who has relocated to England, whereas Darcy is an American, and an heir to a large hotel chain which is thinking of building in India. This alone makes Darcy and Lalita’s financial differences seem more extreme, and I think that’s because America is a developed country, whereas parts of India are developing. However, Darcy is more than just stuck up and rude to Lalita. He also doesn’t understand modern Indian culture, such as not understanding that the bride and groom have some choice in arranged marriages. He doesn’t seem to have any interest in seeing the real India--just the luxurious parts where his mother is thinking of buying property. As for Darcy’s mother, who is the Lady Catherine de Bourgh of this film, she seems to be only interested in seeing or even thinking about the parts of India that fit into her ideas of it, such as yoga and spices. I’m making this film sound incredibly serious, and while it certainly has serious moments, that isn’t the right word to describe its overall tone. For one thing, I think that Mr. Collins of Bride and Prejudice is the most ridiculous of any Mr. Collins on the big screen, thanks to his laugh and disgusting table manners. This film also contains a number of dance numbers, including the one at the wedding where everyone is in traditional garb and there’s something of a dialogue between the men and the women. Otherwise the most notable may be “Take Me to Love,” wherein Lalita and Darcy go on a helicopter ride from California to the Grand Canyon, share a loving embrace, and spend time on the beach, passing by a conveniently placed gospel choir singing back-up vocals. Also, there is a fair amount of them gazing one at one another soulfully. It’s so over the top that even though I know I’m supposed to spend these scenes going “Awwww,” I just wind up laughing. Unlike some of the final scenes in the novel, instead of using words to affirm their feelings and love, Lalita and Darcy often hold one against or give knowing looks against the backdrop of musical numbers during the romantic scenes, making the love story entertaining, although perhaps less believable. I know what you’re thinking. “Liz, Darcy and Lalita talk all the time.” Sure, they talk about how Darcy doesn’t understand arranged marriages and at one point Darcy tells Lalita how strongly he feels about her. He apologizes. However, we never get the gratification of Darcy’s second proposal scene, and with that being said, we never hear Lalita admit that she was wrong. I think Lalita is less likable because of this--what I loved about Elizabeth was that she realized her wrongs and made a conscious effort to admit that and make amends. Instead, we understand the magnitude of Darcy’s travel to India just to set things right. I particularly love Austen’s prose, so in terms of romance, this fell a little short. Don’t get me wrong. 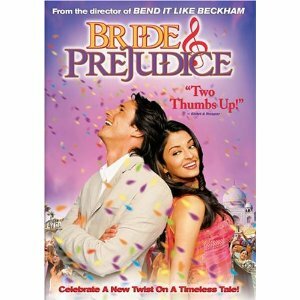 At the end of the day, Bride and Prejudice still makes my list of favorite movies. I’m not going to compare this film to the BBC miniseries, because that’s not what Bride and Prejudice aims to be. If I want to see a meticulously detailed version of Austen’s novel filled with handsome men and scenes that have me busting out the tissues, I’ll watch my miniseries. Bride and Prejudice is perfect for when I need a quick, fun fix of Austen that leaves a smile on my face. I watched this movie a few years ago and had a lot of fun with it. It's cheesy Bollywood goodness combined with the classic P&P tale. I love this movie so much-- I sing songs from it all time :) A great intro to Bollywood as well.